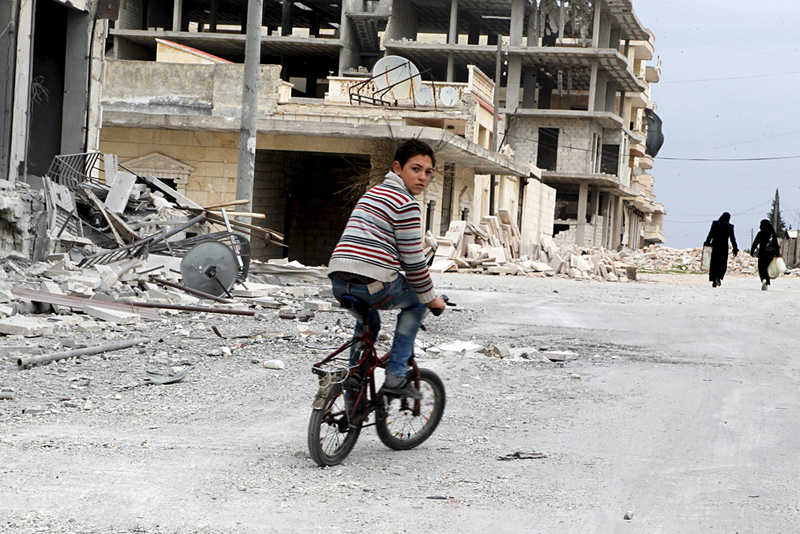 A boy rides a bicycle near damage in Kafr Hamra village, northern Aleppo countryside, Syria February 27, 2016. The Russian Defense Ministry is prepared to support the proposal made by the UN Secretary-General’s special envoy for Syria, Staffan de Mistura, for 48-hour humanitarian pauses to bring humanitarian aid to civilians in the Syrian city of Aleppo and to observe the first such pause next week, the Russian Defense Ministry’s spokesman Igor Konashenkov has said. Syria: What’s behind Russia’s humanitarian operation in Aleppo?